Martinus Christian Wesseltoft Rørbye[needs IPA] (17 May 1803 – 29 August 1848) was a Danish painter, known both for genre works and landscapes. He was a central figure of the Golden Age of Danish painting during the first half of the 19th century. 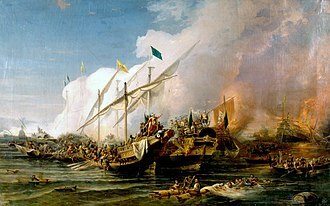 The most traveled of the Danish Golden Age painters, he traveled both north to Norway and Sweden and south to Italy, Greece and Constantinople. He was also the first Danish painter to take to painting in Skagen at the northern top of Jutland, almost half a century before the thriving community of Skagen Painters formed and came to fame, through Michael Ancher, Anna Ancher and P.S. Krøyer. Martinus Rørbye was born in Drammen in Norway on 17 May 1803 to Danish parents Ferdinand Henrik Rørbye and his wife Frederikke Eleonore Catherine de Stockfleth. Martinus was not inclined to schooling, but in 1820 started his studies at the Royal Danish Academy of Fine Arts at 17 years of age. 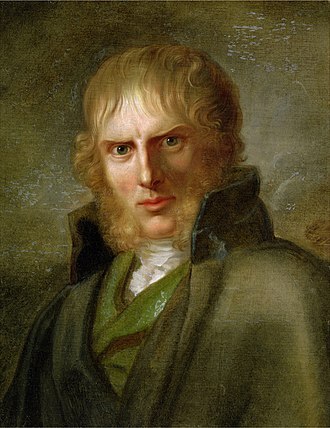 He studied under Christian August Lorentzen and Christoffer Wilhelm Eckersberg, a strong influence on a generation of artists during the Danish Golden Age. Rørbye was a favorite student of Eckersberg, and they formed a close association. He took to Eckersberg’s careful attention to nature and his strivings to capture details realistically. He was also greatly influenced by Lorentzen’s use of color. He won the Academy’s small silver medal in 1824, and the large silver medal in 1828. He competed for the gold medal and won a cash prize. In 1829 he won the small gold medal for his painting Christ healing the blind, which remains in the ownership of the Royal Danish Academy. He never won the large gold medal in spite of repeated attempts. View from the Artist's Window, is a painting by a young Rørbye around 1825, heralding the many travels he would later make with its depiction of a caged bird in an open window, on the border between the safety of his parents' home and the wide, unknown world represented by a berthed ship. Rørbye first exhibited his paintings at Charlottenborg in 1824 and would do so almost every year until 1848. His works were modestly priced, and he found sufficient buyers for his pieces. The majority of his works in the 1820s consisted of views from Copenhagen and the island of Zealand, although he also painted a number of portraits including one of Lorentzen, his painting instructor. Twice, in 1830 and 1832, he traveled to Norway. On the first of these journeys he visited Jutland on the way, a rare destination for painters at that time. On 31 May 1830 he went to Århus on the paddle steamer Dania. Another passenger on the ship was Hans Christian Andersen and the two artists decided to travel together for a while. 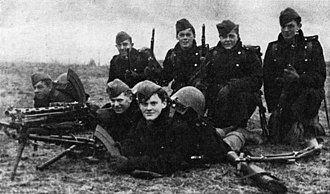 From Århus they went north, staying at the Rosenholm, Clausholm and Tjele estates. 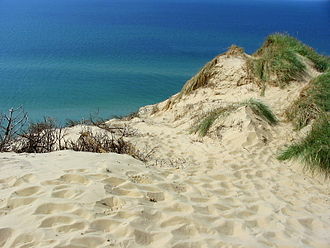 After that, Rørbye and Andersen parted with Rørbye, continuing to the remote and seldom-visited Thy province of north-western Jutland to visit relatives in Thisted. 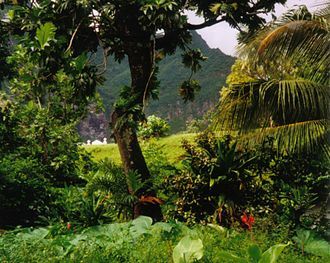 From his journals it can be concluded that he found the place deeply exotic, making detailed sketches and notes of everything from women's costumes and markets to the scenery. However, he found the landscape unsuitable for painting due to the lack of trees. On 7 July he left Thisted bound for Norway. In Norway he painted landscapes under the influence of Johan Christian Dahl and Caspar David Friedrich. In 1834 Rørbye received a travel scholarship from the Academy on account of his talents as a portraitist. He traveled by way of the Netherlands and France to Rome, In Paris he met Peter Andreas Heiberg, August Bournonville and the French painter Jean Auguste Dominique Ingres. When he arrived in Rome, he joined the city's thriving Danish artists community which had Bertel Thorvaldsen as its central figure. A Group of Danish Artists in Rome, is a painting depicting the artist in Rome, painted by Constantin Hansen. 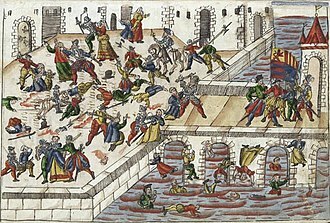 Rørbye is number two from the left sitting behind Bindesbøll who is lying on the floor with a fez he often wore after their visit to Constantinople. 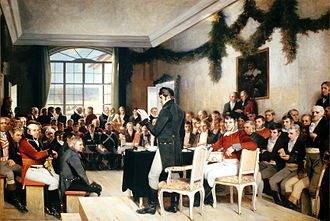 Also appearing in the picture are the painter himself, Marstrand, Küchler, Blunck and Jørgen Sonne, sitting on the table. 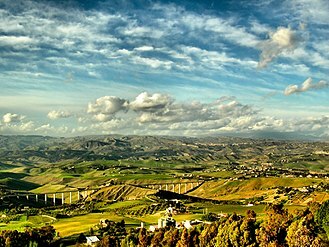 In Italy he traveled to Sorrento, the Sabine Mountains, and Sicily. The following year Rørbye traveled to Athens accompanied by the architect Michael Gottlieb Bindesbøll, one of the compatriots he had met in Rome. 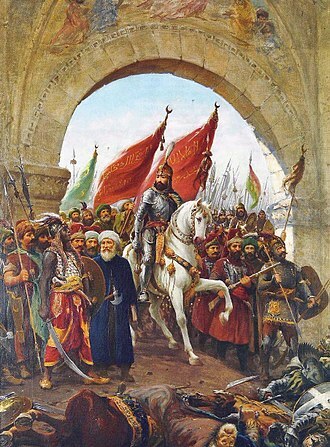 From there they continued to Constantinople in the Ottoman Empire, a rare adventure in those days. 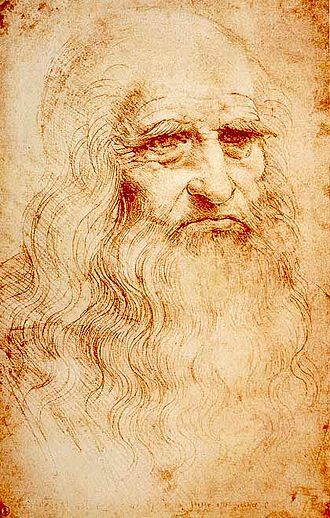 He sketched prodigiously during his travels. 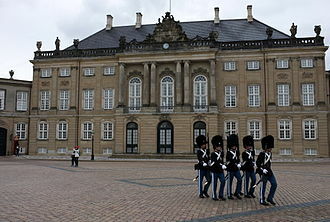 In 1837 he returned home to Copenhagen. His excellent orientalist studies from these exotic locales brought him the Danish public’s attention. The Academy, recognizing the excellence of his work during his travels, invited him to apply for membership by submitting a painting. His task was to create a Turkish folk scene. His motif came from a study of a Caravan near Snyrna. It was finished in 1838 and he was unanimously voted into the Academy. His studies from Greece and Turkey continued to serve as the basis for his creative output. In this regard he admired the work of French painter Horace Vernet. That same year at the Spring Exhibition he received the Exhibition Medal, the first time it had been given out, for a painting of a scene outside the Kılıç Ali Pasha Complex, A Turkish notary witnesses a marriage contract. Typical of Rørbye are the rich colours and careful attention to detail. He married Rose Frederikke Schiøtt on August 29, 1839. His health was not good, however, and that same autumn he traveled again to Italy in the hope of renewing his strength. He painted "Torvet i Amalfi" ("The plaza in Amalfi") during this stay, and it was exhibited in 1842. He returned home again in 1841. He gave private painting lessons to Christen Dalsgaard, and in 1844 became professor at the Academy’s school of modelling. His health deteriorated, and he died on August 29, 1848 in Copenhagen, leaving his young wife widowed and with several small children. She exhibited twelve of his paintings, mostly of Italian subjects, in 1849. He is remembered for his genre paintings, his landscapes and his architectural paintings, as well as for the many sketches he made during his numerous travels. He painted numerous scenes of life in Copenhagen, as well as large compositions showing Italian and Turkish landscapes and scenes of folk life. He painted few portraits. He was one of the most traveled of the Golden Age painters, and distinguished his artistic production by his interpretations of lands rarely explored at that time for their artistic motifs, as well as for his anecdotal genre paintings depicting the Copenhagen of his day. Rørbye visited Skagen on three occasions, painting the local fishermen and the North Sea environs. The first time was in 1833, the year before he set out on his travels to the Mediterranean area and almost half a century before the community of Skagen Painters formed in the town and came to fame. He returned to Skagen towards the end of his life, in the summers of 1847 and 1848. His painting of Men of Skagen on a summer evening in fair weather was one of the last he completed. His works appear in a number of Danish art museums, including the Danish National Gallery (Statens Museum for Kunst), the Ny Carlsberg Glyptotek, and the Hirschsprung Collection. Wikimedia Commons has media related to Martinus Rørbye. ^ Jørnæs, Bjarne. "Rørbye, Martinus". Oxford Art Online. Retrieved 28 October 2014. (Subscription required (help)). ^ "Martinus Rørbye - View from the Artist's Window". Statens Museum for Kunst. Retrieved 28 October 2014. 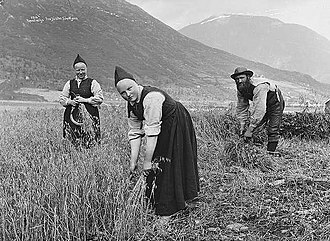 ^ a b "Rørbyes besøg i Thy sommeren 1930". museumsinspektør Jytte Nielsen. Archived from the original on 2011-07-19. Retrieved 2010-08-13. ^ "A Turkish Notary". The Law Gallery. Retrieved 2010-08-14. Johan Christian Claussen Dahl, often known as J. C. Dahl or I. C. Dahl, was a Norwegian artist who is considered the first great romantic painter in Norway, the founder of the age of Norwegian painting. He was the first acquire genuine fame and cultural renown abroad, as one critic has put it, J. C. Dahl occupies a central position in Norwegian artistic life of the first half of the 19th century. Dahl came from a simple background – his father was a modest fisherman in Bergen, Norway –. From 1803 to 1809 Dahl studied with the painter Johan Georg Müller, Dahl looked back on his teacher as having kept him in ignorance in order to exploit him, putting him to work painting theatrical sets and views of Bergen and its surroundings. Another mentor, Lyder Sagen, showed the aspiring artist books about art and awakened his interest in historical and it was Sagen who took up a collection that made it possible for Dahl to go to Copenhagen in 1811 to complete his education at the academy there. As important as Dahls studies at the academy in Copenhagen were his experiences in the surrounding countryside, the mood was often idyllic, often melancholy. When he added snow to a landscape he painted in the summer, it was not to show the light and colors of snow, it was to use snow as a symbol of death. ”Thanks to Sagens recommendations and to his own personal charm, Dahl soon gained access to the leading social circles in Copenhagen. Dahl took part in art exhibitions in Copenhagen beginning in 1812, but his real breakthrough came in 1815. In 1816 C. W. Eckersberg returned from abroad with his paintings of Roman settings, Dahl was impressed at once, Dahls 1817 painting “Den Store Kro i Fredensborg” marked the real beginning of his lifelong production of oil paintings depicting natural subjects. 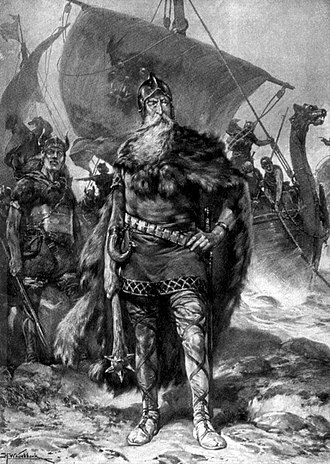 After his success in Copenhagen, Dahl realized that he wanted to live as an independent, one challenge facing him was that the academic preference of the day was for historical paintings with moral messages. Landscapes were considered the lowest kind of art, and perhaps not as art at all. The only landscapes that could be considered art, according to the academy, were ideal, in accordance with this reigning taste, Dahl attempted to give his Danish themes a certain atmospheric character in order to lift them up above what was considered a merely commercial level. The Skagen Painters were a group of Scandinavian artists who gathered in the village of Skagen, the northernmost part of Denmark, from the late 1870s until the turn of the century. 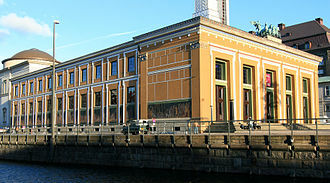 They broke away from the rigid traditions of the Royal Danish Academy of Fine Arts. The group gathered regularly at the Brøndums Inn. Skagen, in the north of Jutland, was the largest fishing community in Denmark. Among the locals, fishermen were by far the most common subject for the Skagen painters, Skagens long beaches were exploited in the groups landscapes, P. S. Krøyer, one of the best-known of the Skagen painters, was inspired by the light of the evening Blue Hour and this is captured in one of his most famous paintings, Summer Evening at Skagen Beach – The Artist and his Wife. Michael Ancher drew attention to the attractions of the area when his Will He Round the Point, was purchased by King Christian IX. He married Anna Brøndum, the member of the group from Skagen. Today the Skagens Museum, founded in the room at Brøndums Hotel in October 1908, hosts many of their works of art. Many of the paintings have been digitized under the Google Art Project and are accessible online. C, presented A World Apart, Anna Ancher and the Skagen Art Colony. The first notable artist to paint in Skagen was Martinus Rørbye and his first visit was in 1833 but he returned towards the end of his life in 1847 and 1848. He is remembered in particular for his Men of Skagen on a Summer Evening in Fair Weather painted in 1848, Another marine painter, Vilhelm Melbye, visited Skagen in 1848, painting his View over Skagen. According to Karl Madsen, the painter Peter Raadsig visited the town on several occasions between 1862 and 1870, painting the dunes and the fishermen, Christian Blache, another marine painter, first visited Skagen in 1869 when he painted his Grey Lighthouse. It was as a result of his influence that the poet, among those who were increasingly frustrated by this approach were Michael Ancher, Karl Madsen and Viggo Johansen who in the early 1870s were studying at the Royal Danish Academy in Copenhagen. Skagen is Denmarks northernmost town and the area surrounding it. 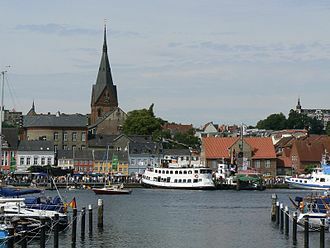 Occasionally known in English as The Scaw, it is situated on the east coast of the Skagen Odde peninsula in the far north of Jutland and it is located 41 kilometres north of Frederikshavn and 108 kilometres northeast of Aalborg. With its well-developed harbour, Skagen is Denmarks main fishing port and has a thriving tourist industry, originally the name was applied to the peninsula but it now usually refers to the town itself. The settlement began in the Middle Ages as a fishing village, thanks to its seascapes and evening light, towards the end of the 19th century it became popular with a group of Impressionist artists now known as the Skagen Painters. The modern port of Skagen opened on 20 November 1907, and with the connections to Frederikshavn. In the early 1910s, Christian X and Queen Alexandrine often visited Skagen and they built the summer residence Klitgården, completed in 1914. Between the 1930s and 1950s the town grew rapidly, with the more than doubling from 4,048 in 1930 to 9,009 in 1955. Skagen reached a population of 14,050 in 1980. As of 1 January 2014 it has a population of 8,198, thanks to the artistic community which still remains in Skagen, the local arts and crafts trade remains important to the income of the town with its numerous crafts shops and galleries. It was redeveloped in 1909–10 by Ulrik Plesner who designed a number of buildings in Skagen, including Klitgården. Skagens first school was the Latinskole, a school, which was in operation from 1549 until 1739. The primary gymnasium of the town, Skagen Kultur- og Fritidscenter, opened in 1972, and was expanded with an aquatic centre. Skagens Sportscenter was completed in 1974, primary to accommodate badminton, the local football club, Skagen Idræts Klub, was founded in 1946 and plays in Jyllandsserien, one of the lower divisions in Danish football. The Hvide Klit Golf Club is located some 17 km south of the town, Skagen station is the most northerly railway station in mainland Denmark and is the terminus of the Skagensbanen. Michael Peter Ancher was a Danish realist artist. He is remembered above all for his paintings of fishermen and other scenes from the Danish fishing community in Skagen, Michael Peter Ancher was born at Rutsker on the island of Bornholm. 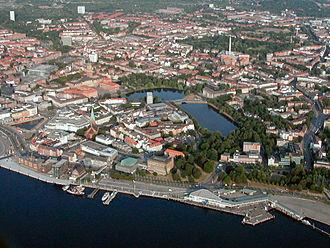 The son of a merchant, he attended school in Rønne but was unable to complete his secondary education as his father ran into financial difficulties. In 1865, he work as an apprentice clerk at Kalø Manor near Rønde in eastern Jutland. The following year, he met the painters Theodor Philipsen and Vilhelm Groth who had arrived in the area to paint, impressed with his own early work, they encouraged him to take up painting as a profession. In 1871, he spent a period at C. V Nielsens art school as a preliminary to joining the Royal Danish Academy of Art in Copenhagen in the year. Although he spent some time at the academy, he left in 1875 without graduating, one of his student companions was Karl Madsen who invited him to travel to Skagen, a small fishing village in the far north of Jutland where the Baltic and North Sea converge. From the mid-1870s, he and Madsen became key members of a group of artists who congregated there each summer, after Ancher first visited Skagen in 1874, he settled there joining the growing society of artists. The colony of painters regularly met in the Brøndums Hotel in Skagen in order to exchange ideas, in 1880 Ancher married fellow painter and Skagen native Anna Brøndum, whose father owned the Brøndums Hotel. In the first years of their marriage, the couple had a home and studio in the Garden House, after the birth of their daughter Helga in 1883, the family moved to Markvej in Skagen. He achieved his breakthrough in 1879 with the painting Vil han klare pynten. Michael Anchers works depict Skagens heroic fishermen and their experiences at sea, combining realism. Key works include The Lifeboat is Carried Through The Dunes, The Crew Are Saved, Michael Ancher was influenced by his traditional training at the Royal Danish Academy of Fine Arts in the 1870s which imposed strict rules for composition. The sand-engulfed Buried Church (tilsandede kirke) at Skagen. 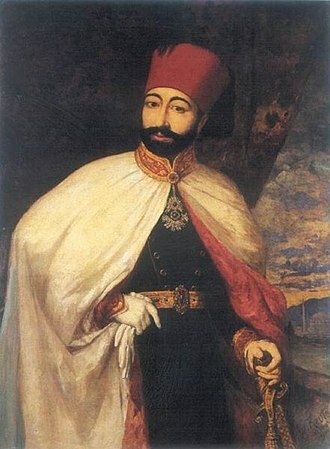 Portrait of the Ottoman Sultan Mahmud II after his clothing reforms. 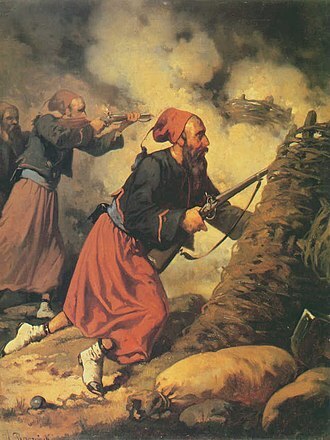 Ottoman Soldier during the Battle at Domokos by Fausto Zonaro. Otto of Greece in an Evzones uniform. French Zouave during the Crimean War (1853–56). Vesuvius overlooking Sorrento and the Bay of Naples. Vintage near Sorrento, Jacob Philipp Hackert, c. 1784. Main pedestrian street of Thisted. Platform facade of Thisted station.